Thousands of people in the Andes mountains of Peru are having their lives affected in both a practical and cultural way by climate change, which is causing the region's glaciers to melt. This is already having a major impact of some aspects of life for the people who live in the mountains - and the government of the country is worried that the situation could get much worse. 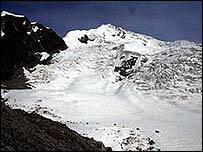 In the last three decades, Peruvian glaciers have lost almost a quarter of their area. "This is an indicator which gave us some concern on how the future was going to be on these tropical glaciers," Patricia Iturregui, head of the Climate Change Unit of Peru's National Council for the Environment, told BBC World Service's One Planet programme. "All our estimations on the basis of this data are that in the next 10 years the top tropical glaciers of Peru - and eventually other Andean countries - above 5,500 metres will disappear if climate conditions remain as the last 10 years." The most immediate threat is coming from the change to water supplies in the area. During the dry season, river water comes exclusively from the glaciers, which melt naturally at that time of year. They then replenish themselves in the wet season. But this balance has been upset - the glaciers are melting faster than they can replenish themselves. As they thaw, dozens of new lakes have spread all over the highland. A recent report by US space agency Nasa suggested that a large chunk of ice in the area could break off and fall into one of these lakes, triggering a devastating flood. 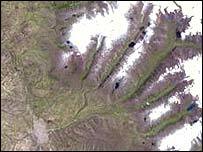 Satellites had detected a crack in the glacier overlooking Lake Palcacocha. 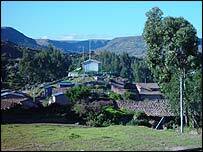 One city under threat would be Huaraz, with a population of 100,000. The news from Nasa came as a very worrying shock to many in the city. "We were all very worried in my family - we packed suitcases with clothes and blankets," Joana, one of the citizens of Huaraz, told One Planet. "We warned our relatives to be prepared." Some scientists dispute Nasa's claims. Mario Giva, of the Peruvian National Institute for Natural Resources, said that it was "necessary for some work in the field to determine whether there is sufficient evidence of any imminent danger". Nevertheless, Nasa is currently in conversation with the Peruvian Government over these findings, which is drawing up plans to respond to the risks posed by the melting glaciers. "We need to make an important effort to plan disaster management and prevention of risks in the future," Ms Iturregui said. "The most important measures to be taken are to organise local communities and to organise an institutional framework able to respond to these adverse effects." She added that an assessment of water resources available in the future was currently under way. "We are in the process of desertification," stressed Ms Iturregui. "The retreat of the glaciers is definitely going to mean a shortfall in the water supply in years to come." Some in Huarez itself recall when, in 1941, a chunk of ice did melt off - and destroyed around a third of the city, killing between 5,000 and 7,000 people. But the melting glaciers are also causing other problems. The deluge is proving too much for some of the canals - some of which are many years old - that supply the farms and mills in the central region. Conversely, the fact that the glaciers are not replenishing themselves is also a potential threat to life in the region, as in the dry season they are the sole source of fresh water. And there are further impacts on the lives of people in the mountains. "Now, glaciers are sliding over the bedrock," said glacier expert Cecil Portocarrero. "This is causing problems - not only for water resources but also for tourism, for climbers." Meanwhile some ancient spiritual traditions are also under threat. Every year thousands of people from across the Andes flock to the Sinakara glacial mountain to attend the Qoyllur Rit'i religious festival. Catholic tradition believes that the Christ child appeared in 1870 to a shepherd boy named Marianito Mayta. Ever since, pilgrims have believed that Christ lives in the rock. And for the Incas - and other civilisations that preceded them - mountains were gods to be honoured, as they supplied water and controlled the weather. Many people come down from the glacier with pieces of ice, as they believe the ice can cure them of illness. "They think it acts like a medicine - like a sacred water," explained mountain guide Feri Coba. "Perhaps at home someone is not feeling well. They will drink it and they will be cured." This year, because of concerns about melting, the Pablitos - the guardians of the Qoyllur Rit'i ceremony - have stopped the ice being taken away. "We decided to eliminate this part of a ritual because we are concerned about the glacier," explained one Pablito. "We have taken this decision to protect the ice." The decision has upset many pilgrims. "The glaciers were bigger - when I first came here this particular one reached around 200 metres down," one said. "In a few years' time we might not have any ice. 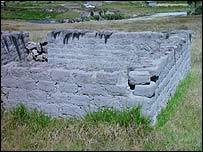 I don't know where the Andean people will be able to go for their rituals."